Earlier I wrote about Austrian composer Aufschnaiter and his set of Concors discordia which drew inspiration from his predecessor Georg Muffat's Armonico Tributo. 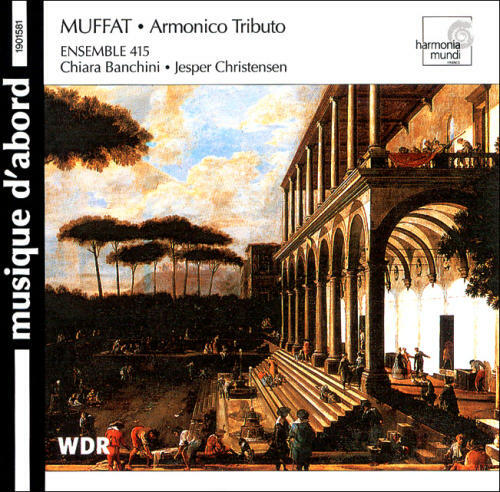 Here is the set of Muffat's Armonico Tributo, written in 1682, recorded by Chiara Banchini and her Ensemble 415. This is among one of my earliest recordings of Baroque music on period performances, before I actually got serious about historically informed performances. I purchased this when I was in college, and back in those days I was just happy to acquire stuff that was new to me. Georg Muffat is often credited (as he also credits himself) as the first to bring the latest French and Italian styles to the German-speaking world and fusing them together to create a new music idiom. In doing so, he was 40 years ahead of François Couperin's later Les goûts réunis. This type of synthesis eventually paved the way to the cosmopolitan style that we often associate with the later German composers like Telemann, Handel, and of course, J.S. Bach. Muffat was actually born in France, where his father's family is of Scottish origin, escaping the religious persecution (anti-Catholic) of Elizabeth I. Muffat's mother was French, for what most scholars know. At the young age of ten, he went to Paris, where he studied with none other than Jean-Baptiste Lully, the godfather of French Baroque music. He later found work as an organist at the Strasbourg cathedral. When it was clear that war was going to break out, he left to Bavaria, where he took up studying the law in Ingolstadt. We then find Muffat in Vienna and Prague. Holy Roman Emperor Leopold I liked Muffat, but not enough, apparently, to employ him. Muffat's first Austrian employer was prince-archbishop Max Gandolf of Salzburg, where Muffat was to become organist and chamber musician. While here in the 1678, he was given permission to go to Italy, this time studying with the great Italian keyboardist Pasquini. As Pasquini and Corelli were good friends and colleagues, masters of their respective instruments, Muffat got to know Corelli as well. Muffat was genuinely impressed by Corelli's op.6 concerti grossi, and he set out to write some of his own. Muffat even had the honor of having the music rehearsed at Corelli's own house. As this is solely based on Muffat's personal statement, we don't exactly know what Corelli thought about Muffat's music. We know the music that Muffat started writing in Rome eventually became the set of Armonico Tributo, first published in 1682 and dedicated to his employer Max. Titled "sonatas for few or numerous instruments," Armonico Tributo is a set of 5 "sonatas" written for 5 parts, although the orchestration was open. As a full ensemble, the music has a texture that comes straight from Corelli, with a solo sections of the concertino of two violins and cello in contrast with the full tutti passages, clearly marked by Muffat on the score. Muffat even suggests that the concertino instruments can be replaced by oboes and bassoon to achieve a different tone color. Learning from the two most influential and leading figures of French and Italian music, Muffat's experience must have been profound. The synthesis of both styles for him, therefore, must have been very personal and complete. The Italian Corellian influences include the grave chordal openings and fast contrapuntal sections, and of course concerto grosso instrumentation. French Lullian influences are manifested in the different dance forms. While the same dance had both Italian and French versions (Gavotta vs Gavotte, Allemanda vs Allemande, etc), many dance movements have a rhythm that is distinctly French in nature. Muffat expands the dance repertoire past those in Corelli's Op.6 by adding dances like the Bourree, Balletto, and the Rondeau form. These sonatas are generally short in nature, with the exception of the last sonata, which ends with a magnificent Passcaglia. This might be one of Muffat's most recognized piece, and I would say that it's one of the masterpieces of the middle Baroque. Played through a full ensemble, it goes through a variety of textures and moods, from the delicate, intimate, and delicate to the outgoing and vibrant. The ten-minute piece plays through like a nice long narrative, and the rondeau form ensures that the opening theme keeps returning, bringing you back full circle. Played right, it's a piece with utmost dignity and grandeur. Banchini's Ensemble 415 (the number is reference to the accepted Baroque tuning of A 415 Hz, just a semitone below the standard A 440 Hz) is known for having a large number of musicians, close to twice the size of most leading period ensembles. This creates their characteristic sound of having very dramatic contrasts between the soloists and the full ensemble rich timbre. This, however, comes at a cost. The large number of players smooths out the sound and you don't get the sharp clear attacks of ensembles with smaller forces. It's simple physics. That being said, I'm overall pleased with Ensemble 415's performance here. The large forces give extra heaviness to the Grave openings, and for the fast movements, they are pretty cohesive and agile for a group of their size. Of course, their playing can sometimes be considered a bit careful, either from Banchini's artistic direction or from the limits of the ensemble itself. Besides the marvelous Passcaglia, I don't think I found Muffat's Armonico Tributo generally as gratifying as Corelli's iconic Op.6 Concerti Grossi. He has good moments, but ultimately the music falls short of grabbing you like Corelli. I would still recommend the music and recording for those who want entry into Muffat's instrumental music. However, it would take 60 more years before another German guy called Handel would create a perfect synthesis of the Italian and French styles in his own op.6 concerti grossi that would equal, or in some ways, surpass Corelli's. I think the performance here is great; I only wish the recording engineers had used closer miking; the concertino groups sound like they're in an ocean of space. Couldn't quite find the recording location, but they show a picture of the ensemble recording in a large modern concert hall.